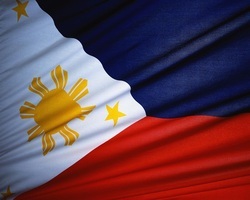 The Philippines (i/ˈfɪlɨpiːnz/; Filipino: Pilipinas [ˌpɪlɪˈpinɐs]), officially known as the Republic of the Philippines (Filipino: Republika ng Pilipinas), is a country inSoutheast Asia in the western Pacific Ocean. To its north across the Luzon Strait lies Taiwan. West across the South China Sea sits Vietnam. The Sulu Sea to the southwest lies between the country and the island of Borneo, and to the south the Celebes Sea separates it from other islands of Indonesia. It is bounded on the east by the Philippine Sea. Its location on the Pacific Ring of Fire and its tropical climate make the Philippines prone to earthquakes and typhoons but have also endowed the country with natural resources and made it one of the richest areas of biodiversity in the world. An archipelago comprising 7,107 islands, the Philippines is categorized broadly into three main geographical divisions: Luzon, Visayas, and Mindanao. Its capital city is Manila. With an estimated population of about 94 million people, the Philippines is the world's 12th most populous country. An additional 11 million Filipinos live overseas. Multiple ethnicities and cultures are found throughout the islands. In prehistoric times, Negritos were some of the archipelago's earliest inhabitants. They were followed by successive waves of Austronesian peoples who brought with them influences from Malay, Hindu, and Islamic societies. Trade introduced Chinese cultural influences which remain to this day. The arrival of Ferdinand Magellan in 1521 marked the beginning of an era of Spanish interest and eventual dominance. Manila became the Asian hub of the Manila–Acapulco galleon fleet. Christianity was widely adopted. As the 19th century gave way to the 20th, there followed in quick succession the Philippine Revolution which spawned the short-lived First Philippine Republic, the Spanish-American War, and the Philippine–American War. In the aftermath, the United States emerged as the dominant power. Aside from the period of Japanese occupation, the United States retained sovereignty over the islands until the end of World War II when the Philippines gained independence. The United States bequeathed to the Philippines the English language and a stronger affinity for Western culture. Since independence the Philippines has had an often tumultuous experience with democracy, with popular "People Power" movements overthrowing a dictatorship in one instance but also underlining the institutional weaknesses of its constitutional republic in others. 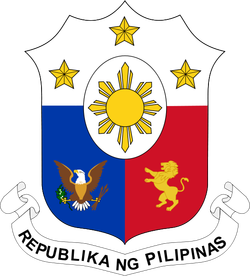 Philippine defense is handled by the Armed Forces of the Philippines and is composed of three branches: the Air Force, the Army, and the Navy (including the Marine Corps). Civilian security is handled by Philippine National Police under the Department of the Interior and Local Government (DILG). In the Autonomous Region in Muslim Mindanao, the largest separatist organization, the Moro National Liberation Front, is now engaging the government politically. Other more militant groups like the Moro Islamic Liberation Front, the communist New People's Army, and the Abu Sayyaf still roam the provinces, but their presence has decreased in recent years due to successful security provided by the Philippine government. The Philippines has been an ally of the United States since World War II. A mutual defense treaty between the two countries was signed in 1951. 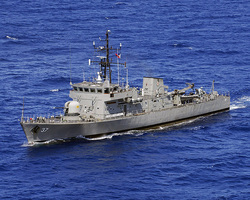 The Philippines supported American policies during the Cold War and participated in the Korean and Vietnam wars. It was a member of the now dissolved SEATO, a group that was intended to serve a role similar to NATO and that included Australia, France, New Zealand, Pakistan, Thailand, the United Kingdom, and the United States. After the start of the War on Terror, the Philippines was part of the coalition that gave support to the United States in Iraq. The United States designated the country a major non-NATO ally. The Philippines is currently working to end its domestic insurgency with help from the United States.